And The CROSS-RC Winner is….. « Big Squid RC – RC Car and Truck News, Reviews, Videos, and More! And The CROSS-RC Winner is…..
Before we announce the winner, we’d like to thank HRP (Hobby Recreation Products) and also CROSS-RC for making this awesome giveaway happen! Go visit their websites! If you have no idea what we are talking about, and just jumped here to see who and what someone one, you can head over to the giveaway page to get all the details. The random number generator chose out of all 6500+ entries Jose Alvarez from San Diego CA, USA. to win the CROSS-RC SU4-C! Congratulations! Watch for an email coming your way to confirm, and get your shipping info. You have 48 hours to get back to us. But wait… there’s more! 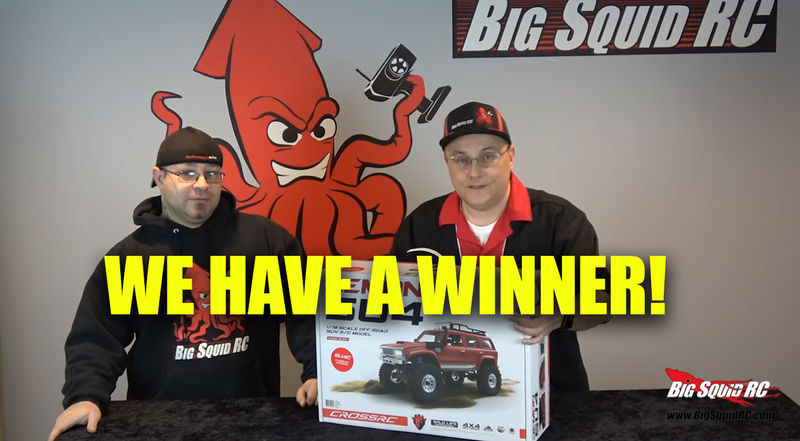 We always love giving more stuff away… so we had the random number thing pick two more people to win some Big Squid RC swag! Those people are: Bill Donovan from Holley NY, and Tamiya Keith from Fayetteville, NC. (Guessing that’s not his real first name.. lol). Congratulations everyone! Didn’t win? Don’t worry, March Bashness is about to start, and we are already working on another giveaway starting soon!